1 Kings 18:20-39 – Elijah revives the widow of Zarephath’s son. Psalm 96 – O Lord you pulled me up from Sheol, you rescued me from those going down to the grave. Galatians 1:1-12 – Paul’s gospel is not of human origin. Paul was set apart before he was born, then called by God’s grace, to proclaim Christ among the Gentiles. Luke 7:1-10 – Jesus raises the widow’s son at Nain. Some people were surprised to hear from me so soon after retirement. The truth is that Bishop Mike really got swamped in May and so I asked if there was some way that I could help. He said, “Yes,” and the rest is history. I’ll be writing one more post after this one. When you take a look a the texts listed above you should know that there are alternatives for the first lesson and the Psalm. Check them out in the ELW, you may want to use them instead. First, Paul probably wrote Romans, 1 and 2 Corinthians (which probably are an amalgamation of more than two letters), Galatians, I Thessalonians, Philippians, and Philemon. Letters often attributed to Paul were probably written by a Pauline school: Colossians, Ephesians, 2 Thessalonians, I and 2 Timothy, and Titus. For example, when you read Colossians and Ephesians the language sounds very “un-Pauline” when compared to the former letters listed above. Second, when we read Paul’s letters we must remember that they are letters written to specific people in a particular context. They were addressing discipleship issues of early Christian communities. 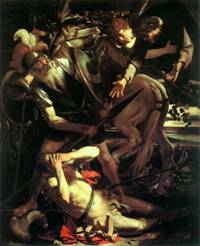 In some cases – 1 Corinthians – they were in response to letters that Paul had received. This means that they are not systematic theology. They are communal pastoral theology. I can remember being taught that Romans was Paul’s theological apogee; his theological tour de force. Well, maybe. As his last extant letter it probably reflects his most mature thinking; as with most of us. (I sometimes read my early sermons and think, “How could they have suffered through this?”) But I believe they should be read with an eye towards the community addressed and not the 16th century. We often read Paul with Reformation issued lenses, which may be a bit myopic. Third, I am convinced that Paul’s letters, while they had to do with the individual’s relationship to God, are really more about how our relationship with God ought to shape relationships within the community. For example, in Galatians the problem/question is about the Gentiles and how they should be received/accepted into the community. Circumcision was the had been the mark of the community, so Paul writes at the end of Chapter 3, “There is no longer Jew or Greek, there is no longer slave or free, there is no longer male and female; for all of you are one in Christ Jesus. And if you belong to Christ, then you are Abraham’s offspring, heirs according to the promise.” It’s about the relationships between people. He then launches into 1:18-32. (Yes, I hate to revisit this; but I must.) And I believe that section was rhetoric. It was the common, often used, word on the street, stereotypical polemic that the Jewish community used about the “Gentile culture.” “Why should we not welcome the Gentiles? Here’s why, and we all know it!” If this is not the case, then Paul’s whole attack beginning at 2:1ff makes no rhetorical sense. 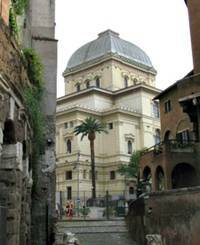 The synagogue in Trastevere today. but are we willing to believe that about those around us? What about the “other?” What does it mean to have a “Galatian like” community based on grace? As I said last week, now we are done with systemic theological speculation and are finally talking about what all this means for us here on earth; not for God in heaven! This is the kind of interpretation that, IMHO, would make a sermon series on Galatians communally life giving, rather than just being more Lutheran navel gazing. In an initial sermon, it might be good to develop a rich vision of what this “gospel of Christ” is; because it is more multi-textured than “Jesus died for your sins.” That is not the issue in Paul’s chastisement of the Galatians. And it certainly doesn’t mean a “prosperity gospel.” What do we mean by “the gospel?” Better yet, what does the “gospel of Jesus” look like? How is it perverted? “How we hear righteousness and justice also affects what we think the gospel, the good news about Jesus, is. In the first chapter of Paul’s letter to Christians in Rome, the only letter Paul wrote to people he didn’t know in person, he crystallizes the gospel as “the power of God for salvation to everyone who has faith…. For in it the righteousness of God is revealed through faith for faith; as it is written, ‘The one who is righteous will live by faith'” (1: 16- 17). Once again, righteousness and righteous are better translated as justice and just. But does justice here mean punitive justice- that God will punish people? If so, how can that be good news? Only if justice means distributive justice can the gospel be good news- namely, that God offers grace equally to everybody. For Paul, this meant to Jews first, but also to Gentiles. God’s distributive justice- God’s offer of grace- is for everybody. As a saying attributed to Jesus puts it, God makes the sun rise on the evil and the good and sends rain on the just and unjust (Matt. 5:45).